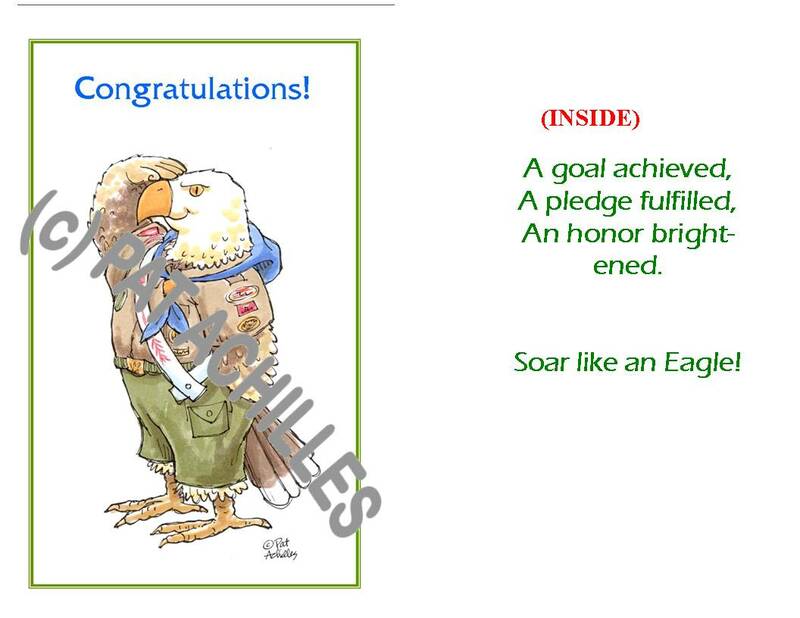 Even before my son earned his Eagle rank, I illustrated the Eagle Salute card below for his Eagle Scout friends because I was so impressed with these fine young men. 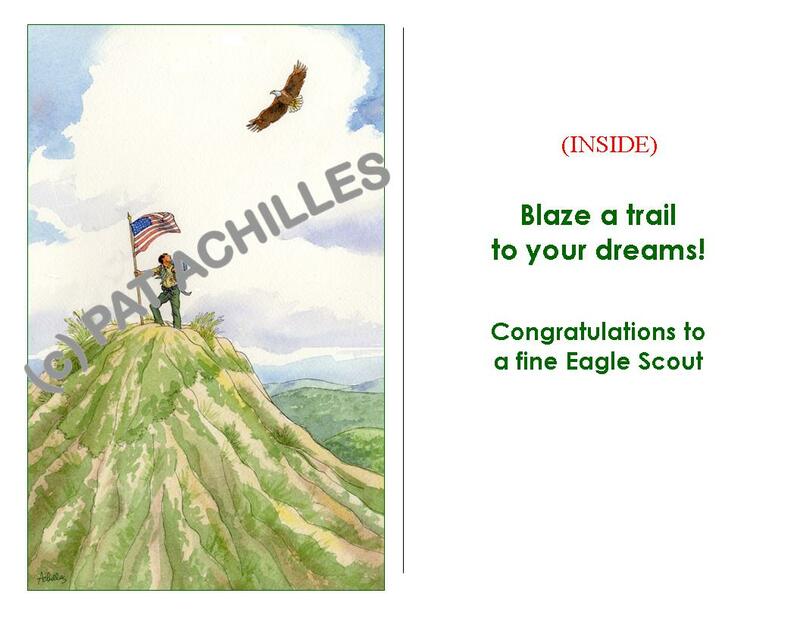 I drew the Eagle on a Hilltop card for my son when he eventually achieved Scouting’s highest honor. 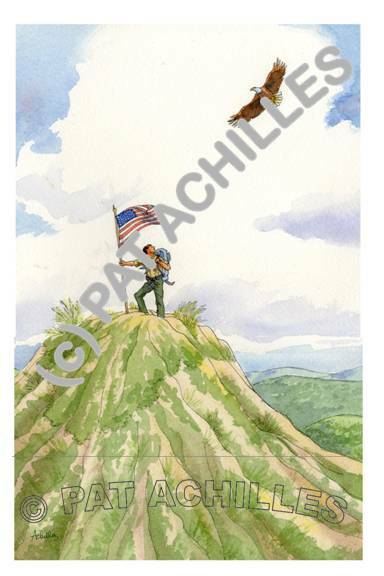 By request I also created the Eagle on Hilltop posters below, which when framed make a handsome gifts for a scout, his family, or troop. Both of the congratulations cards are printed in full color on sturdy glossy card stock, 5 1/2″ x 8 1/2″, with an envelope included. While the cards are larger than standard greeting cards, they still take regular first-class postage. The cardstock is from a sustainable-forest paper company and the cards are printed in Doylestown, PA. For each item purchased I will make a donation of 10% of my profit to the National Council of Boy Scouts of America. You can click on the card image to see an enlarged view. Clicking on the button below the item will take you to my Etsy page, where you can use Paypal or credit card to purchase a card. The card will be put in the mail to you the following business day. I also offer a box of 8 cards and envelopes (4 of each of the two designs) for a discounted price, below. 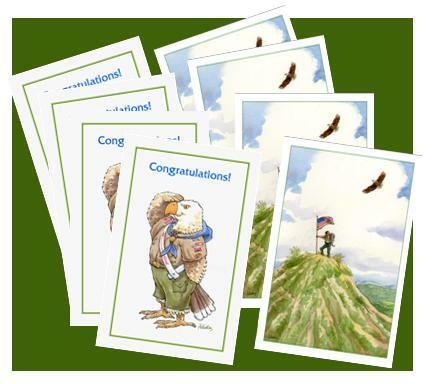 If you are sending a card to someone other than a new Eagle Scout – a wonderful troop leader or a supporter of Scouting, for instance – and would like the inside of the card to be blank so you can write a personal note, just email me that request. Copyright watermarks on the images below are for online protection, these imprints do not appear on the actual cards and posters. EAGLE ON HILLTOP CARD with envelope. $4.50 each, plus postage. Click on the button below to go to my Etsy page to purchase. EAGLE SALUTE CARD with envelope. $4.50 each. Click on the button below to go to my Etsy page to purchase. BOX OF 8 CARDS – SAVE $6.00 over the single-purchase price. 4 Eagle Salute and 4 Eagle on Hilltop, with envelopes. $30.00. Click on the button below to buy. SMALL POSTER. 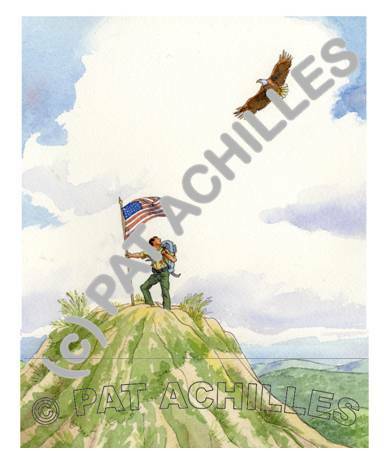 Eagle on Hilltop poster, 8″ x 10″. Fits into 8″x10″ mat for framing (mat and frame not included). Cost is $8 plus $2 postage, total of $10.00. Click on button below to buy. LARGE POSTER. Eagle on Hilltop poster, 12″ x 18″. Cost is $12 plus $4 postage, total of $16.00. Click on button below to buy. All images and text on this page are copyright Pat Achilles. They may not be used without the consent of the artist. For permission, licensing or commission fees, please write me via my Contact page. Do you offer expediated shipping on greeting cards. I remembered at the last minute that you had eagle scout cards and I need one for Saturday. Or, if you are still in the Bucks County area is there a way I can pick one up. Carolyn – of course! I’m in Doylestown – can you email me at achillesportfolio (at) gmail.com and give me your phone or email address?